The market research company Survation has distanced itself from how an opinion poll it carried out about British Muslims has been reported by the Sun. The newspaper is facing an increasing backlash against its front-page report of an opinion poll purporting to show that one in five British Muslims had “sympathy for jihadis”. The tabloid has been accused of misrepresenting the results of the poll, which showed that 5% of respondents agreed with the statement: “I have a lot of sympathy with young Muslims who leave the UK to join fighters in Syria” and that 14.5% said they had “some sympathy”. Critics argued that the use of the term “sympathy” was ambiguous and that it was not clear who was meant by “fighters in Syria”. 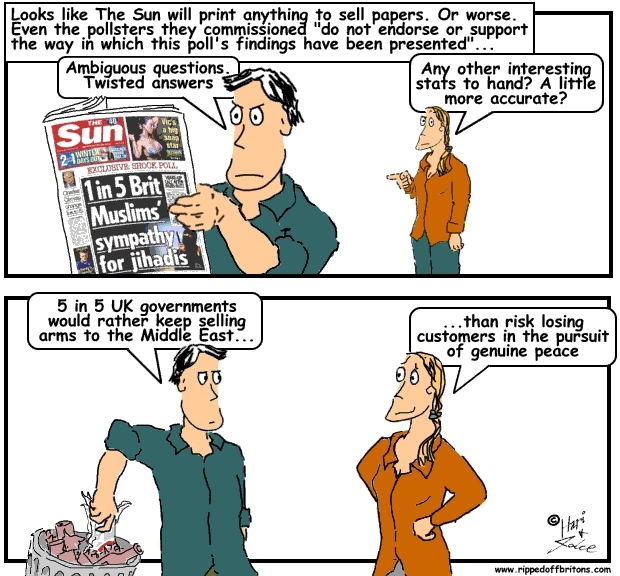 Ben Page, the chief executive of Ipsos Mori, said: “The main issue with this poll is the reporting, which made it appear that one in five of those sampled supported Isis, when in fact they were expressing sympathy with people going to fight in Syria, as I understand it, which could of course include British ex-servicemen fighting against Isis with the Kurds, or anti-Assad Muslim forces who are also fighting against Isis.” Damian Lyons Lowe, Survation’s chief executive, told the Guardian: “Survation do not endorse or support the way in which this poll’s findings have been presented by the Sun newspaper and others. Neither the headline nor the body text of any articles published were shared with or approved by Survation prior to publication. “Survation categorically objects to the use of our findings by any group, as has happened on social networks, to incite racial or religious tensions.” Survation conducted a similar poll for Sky News in March. It showed a higher proportion of Muslims – 28% – showed at least some sympathy with young Muslims leaving the UK to join fighters in Syria. Non-Muslims were also polled at the time, using the same wording, and 14% agreed they had at least some sympathy with the statement. The Sun did not mention these figures in its story on Monday despite being aware of them. Arab states that buy billions of dollars worth of weapons are at high risk of corruption and pose a continuing threat to regional security and stability, according to a new report by watchdog Transparency International. All 17 countries suffer from lack of oversight, excessive secrecy and widespread nepotism, with networks based on family and business ties in the procurement of defence contracts. High-ranking Saudi princes preside over powerful agencies and use them to distribute patronage. Overall the region has some of the most rapidly growing defence budgets in the world, with a total spend of $135bn. Up to a third of all government spending can be on defence. There is also well-documented evidence of weapons from a wide range of countries reaching terrorist groups such as Islamic State and the Houthis in Yemen. Arms companies are to be warned that the Government’s Budget commitment to boost military spending is not a licence to rip off the Ministry of Defence, which will “not tolerate inefficiency or poor performance”. Defence Secretary Michael Fallon used a keynote speech at the world’s largest military airshow to fire the warning shot across the bows of some of the UK’s biggest companies. “While the defence budget is now protected, that doesn’t mean going back to padding profit margins through fat government contracts,” Mr Fallon is due to say. The Government will expect industry to take on more of the risk involved in future projects, the minister will also warn. This could come in the form of sharing cost over-runs. Building the Navy’s new aircraft carriers was originally budgeted at £3.65bn, though the final figure is now £6.2bn after specification changes by the MoD. Any further cost over-runs will be split between the MoD and the project’s contractors.